Other doctors in the group have a lot of experience in developing instruments. My research training in neuropharmacology is a good fit because the next frontier is the applications of new medicines to the mechanics of eye surgery. At Illinois Retina, we combine research and clinical research studies with patient care to push the edge of medicine. Mathew W. MacCumber, M.D., Ph.D., is a nationally recognized expert in the medical and surgical treatment of vitreoretinal disease. He serves as Professor and Associate Chairman for Research in the Department of Ophthalmology at Rush University Medical Center in Chicago. He is also Chairman of the American Academy of Ophthalmology Council and a member of the American Academy of Ophthalmology Board of Trustees. He has been with Illinois Retina since 1996. A native of New Jersey, Dr. MacCumber obtained his undergraduate degree from Princeton University. He earned both a medical degree and a Ph.D. in neurosciences from the Johns Hopkins University School of Medicine. 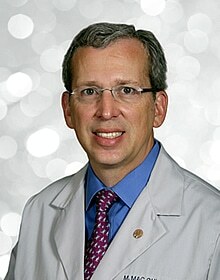 Dr. MacCumber performed his ophthalmology residency at the Wilmer Eye Institute at Johns Hopkins and completed his vitreoretinal fellowship at the Duke University Eye Center in Durham, N.C. Dr. MacCumber was appointed assistant chief of service at the Wilmer Eye Institute in 1995 before joining Illinois Retina. He is certified by the American Board of Ophthalmology. Dr. MacCumber’s unique credentials – Ph.D. and M.D. – allow him to combine his expertise in neurosciences, pharmacology and medicine to help advance the future of retina care. To that end, Dr. MacCumber has participated in a number of major clinical trials and research studies, including several related to diabetic retinopathy, age-related macular degeneration and emerging surgical techniques. Dr. MacCumber is also a busy writer and lecturer. He has authored and edited the popular Management of Ocular Injuries and Emergencies, and numerous book chapters. Dr. MacCumber has written dozens of clinical and research publications, and is a frequent reviewer for numerous leading specialty journals. Dr. MacCumber holds board positions at severalprofessional societies and organizations, including the Macula Society, Chicago Ophthalmological Society and the American Society of Retina Specialists, and serves as an advisor to a number of pharmaceutical companies. He has won numerous awards and honors, including the Achievement Award and two Secretariat Awards from the American Academy of Ophthalmology, and both the Honor Award and the Senior Honor Award from the American Society of Retina Specialists. He has been listed in Best Doctors in America. Dr. MacCumber is on staff at several area hospitals and sees patients at Illinois Retina’s Oak Park, Rush University Medical Center, Skokie and Lincoln Park office locations. When he’s not seeing patients, Dr. MacCumber enjoys playing tennis and spending time with his wife and children. An accomplished oboe and saxophone player, Dr. MacCumber inherited his love of music from his father, who was a jazz pianist with the big bands that used to play in Chicago. He still enjoys music, particularly classical and jazz.